Anyone following the news will know the fire season has come early to the Rockies. We're right in between two of the fires. 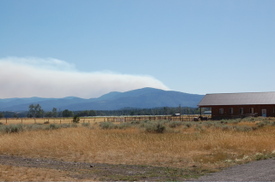 In this shot above that I took from outside our house this afternoon, you're looking north to the Conger Creek fire. At the last report, it was 3,200 acres and 0% contained. That's Travis, by the way, who wanted to appear as if he were on fire look-out duty. 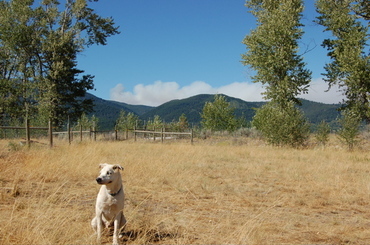 The wind kicked up today, which is why the smoke plumes in these photos are drifting to the east. Of course, the wind is the last thing anyone needed with the fires. Here's the other major fire near us, the Mile Marker 124 Wildland fire, which is burning to the south of us. This shot shows the smoke rising from the ridge behind Beauty's Barn. As of today the fire was about 1,500 acres and 5% contained. Neither one of these fires is as close as they appear in the photos, fortunately. But this time of year is always nerve-wracking for us because of the fire danger. In our location, we're concerned most about a fast-moving grass fire. The grass now is just tinder-dry and ready to burn. With all of our blind horses out on pasture, this is our biggest worry. 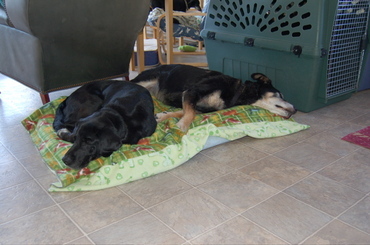 No matter how many dog beds there are in the house, sharing seems to be the order of the day. (Apparently lime green is the couleur du jour as well, judging from these photos.) In the photo above, blind Evelyn -- our singer and dancer and fetch star -- is snoozing along with our old boy Dillon on one of the beds in the living room. Dillon, bless his heart, is about 15 now and can no longer get up on his own. Thus whenever he wants to get it up -- oh, about every 10 minutes throughout the day, or whenever we get on the phone -- he starts barking to let us know he's stuck and needs help. So when he's sacked out like this, Alayne and I get a welcome break from being his personal elevator service. And this afternoon when I was at my desk, I turned around and saw this pair on the floor behind my chair. 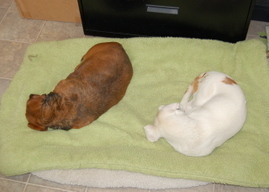 That's blind Callie, the plump Dachshund also affectionately known as "stubby tubby," and new arrival Baron, the little blind-and-deaf guy. Baron is keeping us on our toes because he is a fearless explorer who gets through the fence around the house and starts wandering. Now, this is sheep fence with small squares that's designed to keep all sorts of canines and other predators away from the woolly ones. We use it because it's been great at keeping all of our other dogs in ... but Baron is small enough and intrepid enough that he goes through the squares and keeps on truckin'. He has no idea where he's going, but Baron is one of those individuals who believes it's the journey, not the destination, that matters. So there you have it. Dual sleep-a-thons. And when they sleep, we can relax. Sort of. Update on Copper Kid: If you listened to our inaugural "radio" broadcast that we posted yesterday, I mentioned our young Quarter Horse who went down in the pasture on Friday afternoon. Copper Kid has a neurological condition called Wobbler Syndrome, more correctly called cervical vertebral instability. I talked with the equine vet this evening, and although Copper is doing better, he is definitely not in good shape. This afternoon they tried walking him out of his stall and down the aisle to the X-ray room to get radiographs of his neck, but he couldn't make it safely -- the vet was afraid he was going to fall over -- so they took him back to the stall. They got one X-ray there using a portable unit, and it does show where his cervical problem is. This is not new information ... we knew he was a Wobbler when he came, that's why we took him ... but after a couple of years of remarkable stability, he's had a tremendous set-back. I'll post more later, but right now he is staying at the hospital at least until Wednesday. Our little blind foal Cash is about to turn 6 months old, so we've been slowly weaning him off his mare milk replacer for the past several weeks. He's enjoyed -- and thrived -- on this milk every day since he arrived here back in March at only 4 weeks of age. It's basically powdered milk, but rich and creamy and ohhhh soooo tasty! He would nicker and prance and get so excited every time we walked into his stall with the milk bucket. And, if truth be told, he could get just a tad cranky if you showed up without that milk bucket! If a horse could pout, he'd be pouting. But today was the final day for milk, and we had the video camera rolling this morning as he slurped up every last bit he could find in the bucket. Usually he'd drink the entire thing in 30 seconds, but today he went for over a minute and a half to get the job done. It's as if he knew this was the last milk he'd ever get. (I edited out a chunk of that at the beginning so the video wouldn't be so long.) As you'll see, once he finished the bucket Alayne was holding, he came after me looking for more. The reason he did this is because I've usually been the "milk man" since he arrived, so he figured I must have more somewhere. So I get to be the one who shows up at 9:30 p.m. tonight to close up the barn without milk to offer. Uh oh. I think I'd better have a treat of some sort as a peace offering. We're testing a new Internet "social broadcasting" service this afternoon, so here's our inaugural radio broadcast from the ranch. It begins after about 15 seconds of silence ... which, as the saying goes, is golden. Except in radio. Bear with us while we learn this new system. 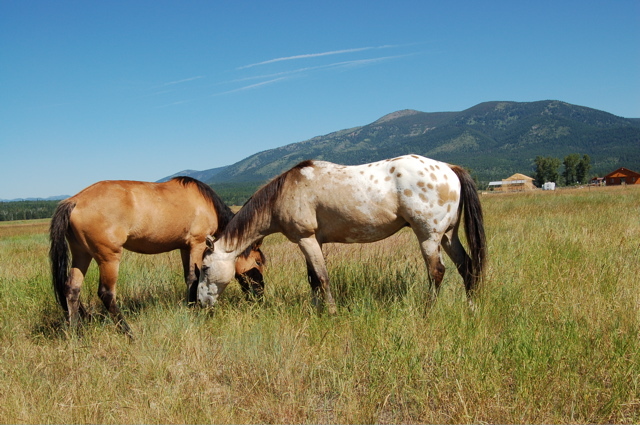 I hauled a few of our horses into Missoula today to see our equine vet, Dr. Bill Brown. In the photo above, Bill is taking out the sutures from blind Cash's hernia operation a few weeks ago. Bill's vet tech Betsy L. is holding Cash, who's making it clear he does not like whatever it is Dr. Bill is doing down under there. Notice that back leg pulled up! He danced around like this for a while, first that leg then the other one, but he never kicked out. Despite the little equine protests, Bill had the sutures out in no time flat. Here are the other two who needed to see the doctor. 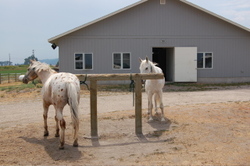 That's old Crazy Horse on the left -- he's actually not blind, just ancient -- and blind Laddie on the right. Both have lameness problems ... Crazy Horse's is just really bad arthritis, and Laddie's left front leg is very stiff and lame from an old injury. Crazy gets cortisone injections in his joints, which so far has made a dramatic difference in his ability to walk. So he was in for another cortisone treatment. Laddie seemed to have a rear leg or hip problem a couple of days ago; his gait was off and his right hip would thrust up when he walked, but we couldn't quite tell what it was from. Bill examined him and determined it was from Laddie compensating in a new way for his left front leg's limited movement. We X-rayed his front knee again this afternoon but didn't see any noticeable deterioration. The treatment plan for him is also a cortisone injection in that leg and other anti-inflammatory medication. With that, I loaded the young, the old, and the lame back into the trailer and headed for the ranch. This is our original pair of lovebirds, blind Madison on the left and her boyfriend, blind Bridger, on the right. From the moment we put them together for the first time, they have been inseparable. Even now, years later, whenever we take them out to pasture we have to take them out together, side-by-side. That's because they get so upset at being separated -- for even a minute, literally! -- that they become anxious and start circling at a trot, whinnying like mad for each other, and putting "love-is-blind" into motion ... as in, walking into the fences. Which they never do, except when they're separated. So side-by-side they always are, either going out to pasture or coming back in to the corrals. And when left alone, as you see here, they're still that way! 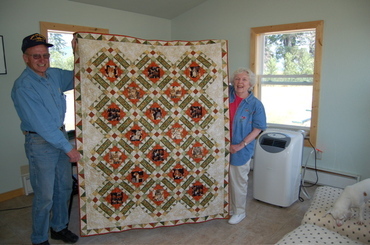 Back in March, Scott and Barbara Edwards of Seeley Lake, Montana, launched their second quilt raffle for the sanctuary. Barbara is a quilt maker whose first quilt raffle for the ranch raised $1,000 for the animals. That first raffle was held only locally, but this year we announced it on the blog so others could participate as well. And with that, Barbara handed us a check for $1,000! Thank you to Barbara for her incredible generosity -- and stunning quilt -- and to everyone who purchased a raffle ticket. In the end, the animals are the real winners! Speaking of animals, that's new arrival blind-and-deaf Baron on the chair ... he came out to visit and say hello. 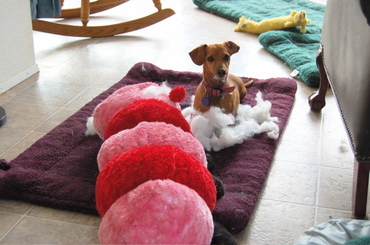 Apparently Daisy the miniature Dachshund didn't get the memo about not chewing on Mr. Caterpillar. This enormous stuffed toy -- Bailey's favorite -- has survived for nearly a year while hundreds of lesser toys have come and gone, defluffed and destuffed within 24 hours of their arrival. 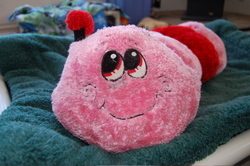 We're pleased to report that Mr. Caterpillar is now resting comfortably after the surgery and his recovery is going well. As for Daisy ... she swears she never saw the memo. I was ready with the video camera when Alayne finally returned from her week away. Her minions -- including chief minion Oscar -- were gathered at the gate, waiting excitedly for their leader. In this brief 40-second clip, you'll notice Oscar leaps over the board at the gate and heads towards the truck, thinking he's going for a drive apparently. Then, Alayne picks up Daisy,who promptly pees all over the front of Alayne's shirt. (That's why Alayne didn't turn towards the camera ... which I found out after I turned off the camera.) So that's one risk when you have incontinent minions -- be careful who you pick up! And the more excited they are, the more likely they are to pee on you. Now, to be one of Alayne's minions, you can be no taller than 6 inches at the shoulder, have a shrill bark, and show unswerving devotion to her. The only exception on the size rule is blind Goldie, who towers over the other minions. In the mix you'll see in the video are blind Widget, blind Callie, Daisy, Oscar, Bailey, Belvie, and yes, Goldie.